What did you think of Eve’s decision not to say anything the night of the accident? Do you think she made the best of a terrible situation, or that she should have confessed immediately? Do you think she might not have confessed if Melissa hadn’t been a suspect, and if Tyler hadn’t planted evidence framing Robbie? Charlotte ultimately says to David that if it were “Tyler lying there and Amy who needed saving…If it were my Amy—I’d have done just what Eve did.” (421) What would you do in the face of such a situation? 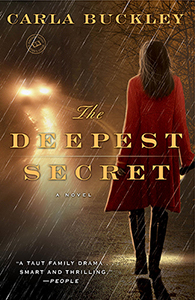 Discuss the novel’s title, The Deepest Secret. How does it apply to the story? The author stresses that it is human nature to try and keep secrets. But do you think it’s true that all secrets will eventually come out, that it’s also in human nature to want to know—and, to a certain extent, want to confess? The relationship between Tyler and Eve is the backbone of the novel, but it’s a complicated one. Describe the arc of their relationship from the beginning to the end. Were you surprised to find that they were ultimately quite similar in their drive to protect their family? At one point, David reflects that, “Now he sees the grays, the blurry lines. He understands how loneliness might drive a person to make terrible choices.” (171) Do you agree with David’s assessment? What do you feel the novel says about loneliness and its impact on our actions? Holly asks Tyler, “Do you think it’s better to have dreams and lose them, or not have dreams at all?” (178) How would you respond? Throughout the book, there is the recurring idea that we can’t ever truly know what another person is capable of. Do you think this is true? Why or why not? Tyler slips through the night, observing people when they believe they are alone, and is surprised by what he finds. Do you think, in the moments where we are unobserved, we are all different people? That we are more ourselves? How much of our personalities are defined by how others see us? What did you think of the author’s portrayal of parenthood and parent/child relationships? Did it resonate with you? How much of a factor did Eve’s age/experience play into your sympathies for her or lack thereof? If it had been Melissa who had hit Amy, would you have viewed the situation differently? If so, in what ways? Mourning and loss are themes of the book. How does loss—or the anticipation of loss—affect certain character’s decisions? What did you think of the conclusion of the novel? Did it turn out as you expected? Were you satisfied?